Home > Musculo-Skeletal > How can Osteoporosis be Prevented? Osteoporosis can be a very debilitating condition that can have an extremely detrimental effect on health, quality of life and emotional and psychological health and welfare.It is vital that steps are taken early in life to decrease the likelihood of this condition from arising.Many people do not fully understand or even realise any connection at all between the habits and lifestyles that are executed in the first few decades of life have a clear connection to illnesses developed in the later years. There are four main areas that can be addressed in order to prevent osteoporosis from occurring. These measures may not prevent it in all cases but will certainly have a positive effect on many. Diet is a key factor in the prevention of osteoporosis especially in today’s modern society in which women and men of all ages are becoming more aware of their body image and making sometimes drastic dietary changes in order to conform.In most cases losing a few pounds or even stone will be extremely beneficial but it is the methods in which the weight is lost that is the main concern.The body needs several different vitamins and minerals to function effectively and the skeletal frame is no different. Calcium is one of the vital minerals. It is needed in order for blood to clot and for the major organs such as the heart and lungs to function properly, and for the strength and mass of the bones. Bones are not just simply grown in childhood and then stay the same, they are a living collection of cells that are constantly renewed and broken down.The substances that make up the bones are fortified with calcium. This means that without calcium these substances are weaker and do not function properly. 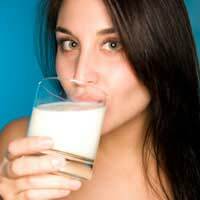 If calcium is not included in the dietary intake, the calcium supply in the bones depletes and they become less dense and can weaken or break more easily. It is also essential that calcium supplies are laid down during childhoods and adolescence as around 80% of bone mass is constructed during these years.In order for calcium from nutrition to be used by the body, vitamin d must be present in order for it to be absorbed. Vitamin D can be found in many food sources that have been fortified or supplemented, or it can be gained from exposure to the sun. This does not mean sun bathing for hours every day, but a few minutes exposure will be really beneficial in helping calcium to absorb therefore preventing osteoporosis. Not only good for preventing osteoporosis, exercise is essential in maintaining almost all of the bodies functions.By taking part in weight-bearing exercises that minerals in bones will have to work harder and over time will become stronger as a result. These exercises should take place from childhood in order to develop bones that are already strong. The exercises should be carried into adulthood to maintain the bone density achieved in childhood.Taking part in resistance exercise helps to strengthen the muscles and ligaments that support the skeleton which in turn will help strengthen bones, These exercises are better for older generations who may not be able to participate frequently in weight-bearing or high impact activities. Certain lifestyle choices such as smoking can be extremely disadvantageous regarding the development of osteoporosis. It is well documented than smoking decreases the levels of oestrogen in the body and oestrogen can help to protect the bones.Stress can rob the bones of their calcium supply so it is in the persons best interest to find a suitable way of dealing with stress without the use of alcohol of cigarettes. This is when the benefits of exercise can be used. It is important that the general population understand the links between diet and lifestyle and health. Talk to your GP or Practice Nurse who will be able to provide you with information. Osteoporosis may not be preventable in some cases but the age of which it becomes a problem can sometimes be delayed. It is definitely worthwhile finding out the facts about the condition and how you can make positive changes in life to help prevent or delay it.